On my recent trip to Kauai I had the privilege of staying with a good friend who grew up on the island. He made sure that we surfed the best places, went on the best hikes, and ate the best food. It wasn’t hard to eat good food all the time since the local family I stayed with cooked some of the best food ever, but there were a couple of restaurants in Kauai that we just had to try. Duane’s Ono Char-Burger was one of those places. Ono Char, as the locals call it, makes one of the best burgers I have ever tasted, and is famous all over the island. It is located on the northeast part of the island of Kauai, right off of Kuhio Hwy, in Anahola. If you’re on a vacation in Kauai then you are definitely going to want to go up to the north part of the island and see the Na Pali coast, and Ono Char is right on your way. Ono Char is a small outdoor place right next to a little convenience store. It is one of those little “hole in the wall” places that you know has the potential to be amazing. The menu is simple. There are burgers, sandwiches, fries, shakes, and a few other specialties. All the items previously mentioned are awesome, but what they are best known for are their burgers. Each layer of the burger is made with the finest ingredients. I tried two of them, and my favorite was the “local girl”. It’s your usual burger but with teriyaki sauce, pineapple, and Swiss cheese. The strawberry shake was exceptional, and the fries were equally enjoyable. The food at Duane’s Ono Char-Burger is not overly expensive. The prices are pretty reasonable making it a good place to grab lunch regularly if you’re going back and forth to the north shore to surf. Especially during these tough economic times, Ono Char is the place compared to the more expensive and formal restaurants in Kauai. Every surfer knows that getting good food is almost as important as getting good waves while on a surf trip. 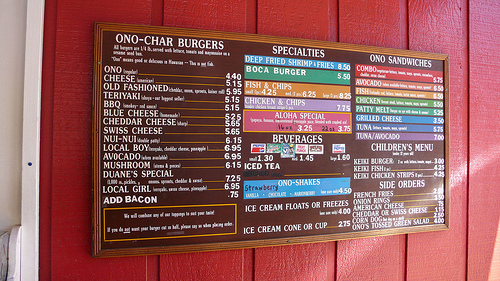 So if you’re on vacation in Kauai, don’t forget to eat at Duane’s Ono Char-Burger for some good local grinds.